Dr. Rima wrote one of her passionate replies to a planted pro-vaccination story that appeared out of Australia. The article was bemoaning a pregnant woman who was not vaccinated during pregnancy for Whooping Cough passing the disease on to her newborn. "Serious complications from the vaccine are not, as presented, rare. They are quite common and, if you consider the metal, excitotoxins, sterilizants, formaldehyde and other components, the logic of injecting these materials directly into the body, bypassing the natural protective barriers of lungs, mucosa and gut is absent while the dangers are obvious." So what happened after Dr. Rima posted her comments? First the comment disappeared and then the comment to which she was responding disappeared. Once again it seems we've transgressed the never-defined "community standards" of an online control system. A couple weeks ago we got an email from GoFundMe telling us we had transgressed their proprietary, and thus not to be revealed to us, "community standards" and last year Dr. Rima got banned by the several hundred papers and outlets of the Murdock Media Empire as well as that one-time bastion of free speech, The Guardian. The Guardian had announced a policy of not allowing vaccine choice advocates access to their media. Now before you Conservatives get all smug about how a Left Publication like The Guardian does not adhere to real free speech standards, you ought to know that just about the same time in 2015 Reason magazine was also toying with the notion that people who expressed conscientious objection to vaccination should not be given a forum on Reason. Little reason left in Reason. Everyone knows about how Wikipedia, Google, Twitter and Facebook censor dissident communications. It's become a common joke... of the gallows humor variety. Less well known are the roles of entitles such as SpamHaus that defines what words are "spam" words... you know, words like “Free” as in “Freedom”. We see how expression is controlled by private companies and well-placed non-governmental organizations through their control of the media. What we don't often notice is how other aspects of the control apparatus are also being privatized. -- that vax reactions are only "1 in a million;"
has been used to implement government policies that the public clearly opposes. The drug company arranges for an initial clinical study where the new vax is compared to another vax (usually one of the most toxic) or to straight Thimerosal not against a true placebo. The clinical trial results as interpreted by the company are submitted to the FDA. Anyone who dies is deleted from the study results (“they did not finish the study”), serious adverse events are likewise dropped as often as possible for similar “reasons”. Anticipated effectiveness numbers are generated by the company from these results or from nothing atall. Pricing levels are presented. Because the vaccine is patented (and federal agencies are required by call law to accept allowed patent claims as "substantiated"0 FDA rubber-stamps the data provided (80% of FDA funding comes from drug company fees). After FDA approval of the vax as a drug the CDC, a branch of FDA, considers recommending the vax. The CDC ACIP committee, where many members have conflicts of interest, recommends the vax (in one infamous example “ethicist” Paul Offitt made tens of millions of dollars “recommending” a vaccine in which he had a financial interest; no, he was not required to recuse himself). Now things get interesting…. because various private actors, such as private prison companies, hospitals and other large employers, join state governments in multiplying vaccine mandates. At the present time we are receiving more and more communications from nurses and others who are being compelled to receive vaccines under threat of loss of livelihood. The Federal Government "recommendation" is turned into private company or state mandates. This spreading-around of the 'responsibility' for the mandates is meant to fragment opposition and increase the cost of asserting our right of Informed Consent. It is meant to chill our expressive association rights. Note though, much of the restrictions are being imposed by private actors. In every case, the issue is communication and the right to express Informed Consent. Whether we are dealing with Dr. Rima being blocked or a nurse being coerced, we are seeing the imposition of restrictions on communication rights "under color of law" by various public and private actors. The phrase “under color of law” comes from the Civil Rights Statutes and describes acting with apparent legal authority, but in a discriminatory manner. When private institutions choose to use their government-granted corporate privilege to restrict people’s expressive association rights, they are acting as governments and must adhere to the strict limitations placed on government in all civilized nations. This includes strict adherence to the law of Informed Consent. As the President of the Natural Solutions Foundation, Maj. Gen. Albert Stubblebine III (US Army, Ret.) 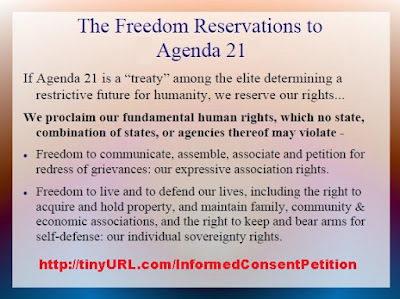 states, "Informed Consent is the defining issue of the 21st Century." It has been argued that wars have consequences. One of the consequences of World War II was that the international humanitarian law of Informed Consent was codified (by American legal scholars as part of the Nuremburg Trials and is now known as the Nuremburg Code) and continues binding on all nations. What is being done in Australia, where families are being given the horrific choice of either submitting their children to unlimited vaccination or losing their access to public assistance, or in California where Gov. Jerry Brownshirt signed S277 that conditions a child's state-constitution-guaranteed "free public education" on receiving certain shots is literally a "crime againt humanity". Along the way, traditional religious and philosophical conscientious objections to vaccination were abolished. But the right to Informed Consent cannot be abolished by either a local government like California or a nation-state like Australia (or the US). It is an international humanitarian right not subject to being abolished by governments. See the UN Bioethics Declaration*. So what does this have to do with Dr. Rima being censored by Murdock, The Guardian, GoFundMe and Google? It's all about how private, quasi-government and government actors are combining together in the continued privatization of coercion through censorship and mandates. Informed Consent, in a world where all the instruments of communication are carefully controlled through "political correctness" and similar non-objective standards, is the central right we must assert to regain – and retain -- our absolute personal sovereignty over our own bodies and minds.